When I was sitting in an interrogation room, with my face to the wall, my eyes covered with a blindfold and my body with a chador, I never imagined that one day I would be at the United Nation Headquarters giving my testimony about this very day. So, I am very glad that I have the chance to be here, especially when many other political prisoners are still locked up inside the prisons or, even among those who were released, have to remain silent and neutralized out of fear. Let me start with my own experience, which is just one example of the many human rights violations that have occurred in Iran since the July 2009 Presidential Election. On 17 July 2009, I was arrested while heading toward Tehran University for the Friday Prayers led by Ayatollah Hashemi Rafsanjani. I was walking on Keshavarz Boulevard with several other female activists when individuals in civilian dress approached us. Refusing to identify themselves or justify their actions, they forced me into a waiting car. After I had briefly escaped, my companions were restrained as I was beaten and forced back into the car. I was taken to one of the intelligence Ministry detention centers, called “the Follow-up Office” and after 4 hours interrogation, I was moved to Evin prison, where I been previously detained in March 2006. In the middle of the night, I was taken to solidarity confinement after all of my personal belongings, including my clothes, my notebook and even my glasses were confiscated. They allowed me to have my glasses in the cell only after I refused to eat anything for three days. I was interrogated five times, each time for more than four hours. First, they wanted me to give them the username and passwords of all of my email accounts and blogs. It was a preliminary question for them, like asking my name and address. Then, they started to ask several questions about everything I had done or related to me, from our activities in women’s movement to my personal life, from the conferences in which I participated in foreign countries to the names and information of my friends in Iran and abroad. They described me as a doll or puppet of western countries, specially the United States, who had a mission to overthrow the government by changing society through women’s demands and the idea of gender equality. But they never formally charged me with a crime. According to Iranian law, which I know very well as a lawyer, I did not have to answer any questions before I was formally accused of a crime. But this regulation, like many others guaranteeing prisoner’s rights, have been left completely unenforced. In contrast with procedure defined by the Iranian code to “Respect the Legitimate Freedoms and the Protection of Citizenship Rights”, they placed me in a solidarity confinement where a light was turn on all the time. I could not see the faces of my interrogators because I had to sit with my face to the wall wearing a blindfold – all of which is totally illegal. I was not tortured physically but one day, they took me and about fifteen male prisoners to a room inside Evin and while I was sitting facing the wall, at least twenty interrogators started to question the male prisoners who were made to sit behind me. These men were brutally beaten while I was forced to listen. In the beginning, I could answer the interrogator’s questions about very simple and nonviolent activities such as distributing printed materials during the demonstrations. But after a few seconds I could not hear any more, and I felt like my head was being crushed between two iron plates. Less than one hour later, I was called for interrogation as my legs and my hands were trembling and my brain was totally empty. I really felt like I was being tortured. Regarding rights violations, so many others had experiences worse than mine, especially among those who were not well known among the public. According to officials, more than four thousand people were arrested in Tehran and several other cities during the post-election events. They were apprehended either in the streets or in their homes and workplaces. Several reliable sources now report that prisoners are suffering from widespread violations of their rights. In addition to the numerous examples of human rights that are systematically violated within the past three decades of the Islamic Republic, during the post-election events, basic and fundamental human rights remain in serious peril, such as equality of persons before the law, the right to peaceful assembly, the rights of political prisoners, and the rights of human rights defenders and civil society activists. According to the fact-finding committee of Iran’s parliament, launched in July 2009 to investigate the complaints of torture and killing of detainees who were arrested in post-election protests, 3 detainees have been tortured to death in Kahrizak detention center. The committee recognized Saeid Mortazavi, Tehran’s former prosecutor general, as the main person responsible for the death of these 3 young men in a report published on January 10, 2010. Unfortunately, however, he has neither been summoned to the court nor has been officially questioned or accused, while many women’s movement activists, journalist and human rights defender are accused of attempts to overthrow the government because of their peaceful activities ! Right now, at least 60 women’s right activists are in prison. Some of them have never been able to call or see their families. In some cases, nobody knows in which prison they are detained. The judiciary refuses to inform prisoner’s families about their situation or cooperate with their lawyers. Not only are the rights of women’s rights defenders being violated, but the rights of all Iranian women are in jeopardy. For example, the Government has recently proposed a new draft of the Family Law (entitled "Protection of the Institution of the Family") and is currently being discussed in the Parliament. This draft is very discriminatory and gender-biased. The draft facilitates polygamy and temporary marriage, both of which are favorable to men and socially unacceptable. For these very reasons, women’s rights activists, since 2007, have regularly expressed their objections to this proposal and succeeded in delaying the vote that would legalize it in September 2008. But now, when many activists are either locked up in prisons or repressed, the Parliament is once again discussing it and unfortunately, is expected to pass it. Regretfully, the Islamic Republic defined this discriminatory draft as one of the upcoming legislation to improve the human right situation in its national report for the Universal Periodic Review. Besides Iran’s international commitments to respect human rights, there exist many rules and legislations domestically, within Iran’s legal system, that concern the rights of prisoners, including the code to “Respect the Legitimate Freedoms and the Protection of Citizenship Rights,” in addition to other procedures, laws, and the Constitution, that are meant to guarantee fundamental rights. I strongly urge the Iranian police and judiciary to respect and enforce these international and domestic laws that guarantee the prohibition of arbitrary detention ; the right to have and visit a lawyer ; the right to regular family visits ; the prohibition of solitary confinement ; and the prohibition of physical harassment and torture. The Iranian authorities must stop giving impunity to Mortazavi and pursue him as well as all the commanders and perpetrators who have been involved in the widespread violation of citizens’ rights during the post-election protests. The Iranian government must withdraw all discriminatory laws against women, especially the draft of the Protection of the Institution of the Family, which is in complete violation to Iran’s international commitments, especially Articles 2 and 3 of the International Covenant on Civil and Political Rights. Shadi Sadr (Persian : ???? ???) 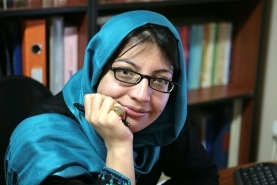 is a notable Iranian lawyer, women’s rights activist, and journalist. She is married, and has a daughter. She is an active lawyer defending execution cases in Iran.